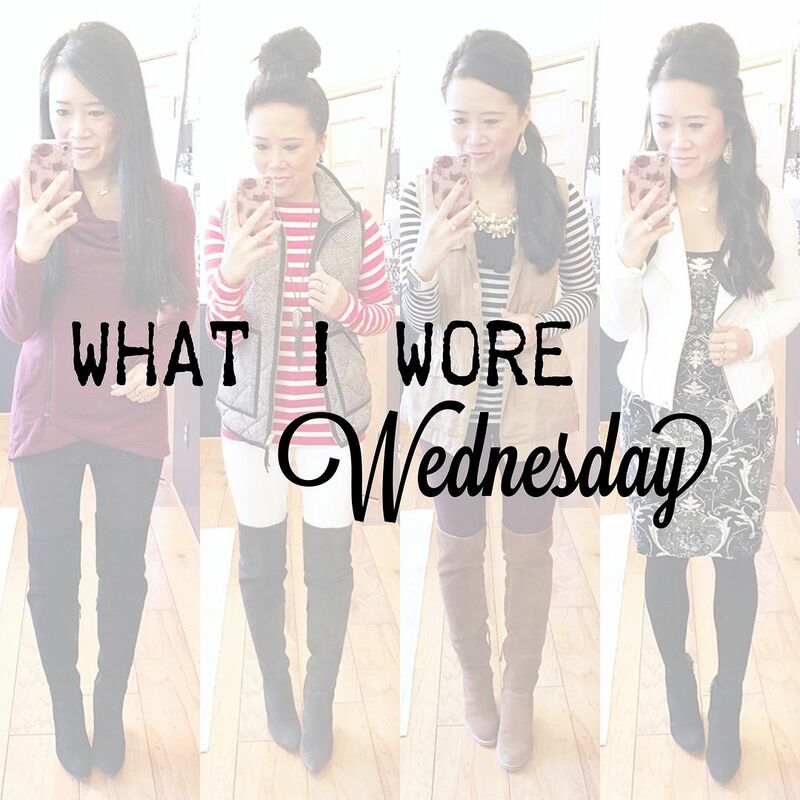 Mixing things up a bit by doing my random roundup in the middle of the week! Sorry if you saw this post and were hoping it was Friday! Since I'm adjusting my blog schedule to be 4 days a week, this week it made sense from a content standpoint to provide this post on Wednesday vs. my usual Friday. I know it doesn't really matter either way, but I like consistency, and honestly, this whole schedule is messing with my head! I don't like change, but I also don't like feeling stressed out, so something has to give! Ha! Anyway, I have a backlog of outfit selfies, so it was time to share some with you! Let's get started! I've had this cardigan for over three years now. Yep, it's true, you can see the first time I wore it in this post here. It's always been a bit snug to wear zipped up and with pants - hence why I'm wearing it over a dress in that older post. I was SO happy when I remembered I hung onto it for so long because I had a feeling it would fit perfectly now, and it does. And I love it. I am also so happy that Modcloth still makes these cardigans because I think I need the black one! I actually think it's quite perfect for transitioning my Pilates outfits to real life outfits. After I wore this cardigan to work, I wore it to/from Pilates and loved it. I need another color. It's inevitable. I'm wearing a small for reference. Ah! The return of the herringbone vest! I wasn't sure how I was going to feel about the vest this season. You see it over and over again in your Instagram feed, I'm sure. I loved how it paired with the red and white stripe top! Usually, when I print mix with the vest, I reach for a plaid, but I loved it with the red stripes. 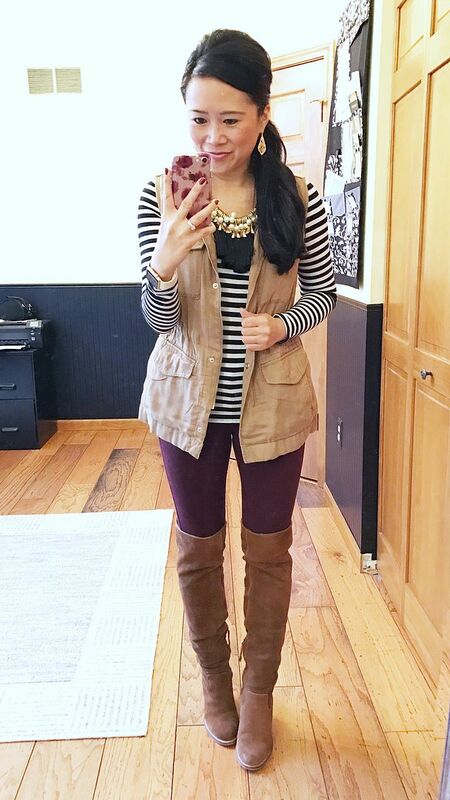 Plus the vest helped tone down the "Where's Waldo" vibe of the outfit! I wish this necklace was still available because you guys need it. You should at least get the one I linked to that is similar! Why, you ask? Because 1) it's the perfect statement piece when a regular necklace doesn't feel "heavy" enough but a scarf feels too heavy and 2) it always yields a ton of compliments. It's a really great piece and finished off this outfit perfectly. You can't see them, but my top has elbow patches. Yep, you need it, too! 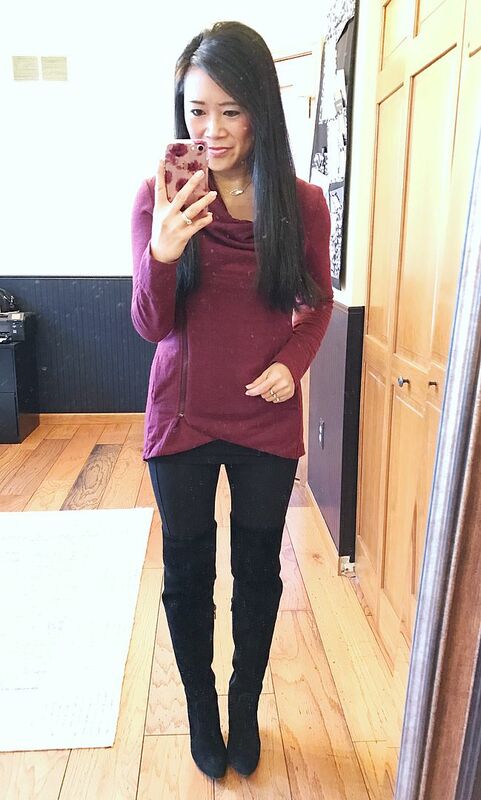 And yes, this is the third outfit of this post that I am wearing over the knee boots. I can't help it! I love the long silhouette it gives me! Knee high boots can cut you off in weird places sometimes but I love how the right over the knee boots stay fitted in all spots over your legs. Last but not least is my foolproof combo of a Bailey 44 dress and a moto jacket. I tried on this dress with a chunky cardigan instead, but was not feeling it. I should have taken a photo with it so you could see the comparison. I just love the structure of a jacket as compared to a cardigan. 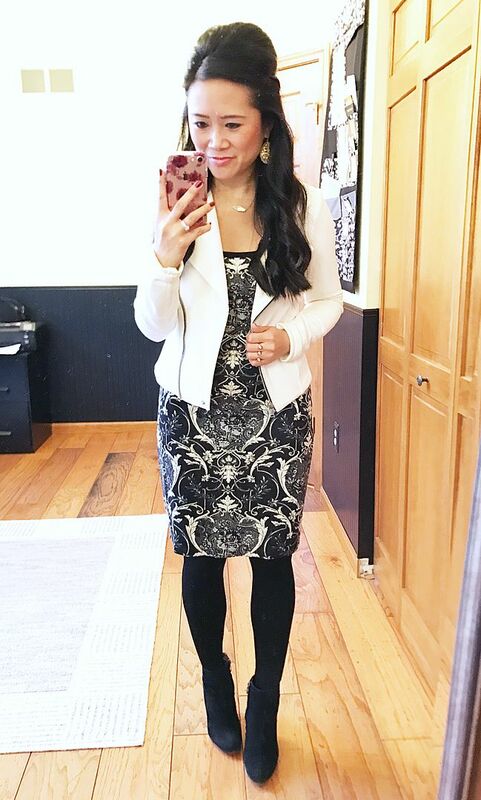 The exception is the Modcloth cardi from the start of this post that I can wear fully zipped to feel that same structure! That's all I have for you today! Hope your hump day is a good one!!! You have the best boots collection, and it's so fun to look at a 2013 posts lol. Now I feel like I need grey boots. 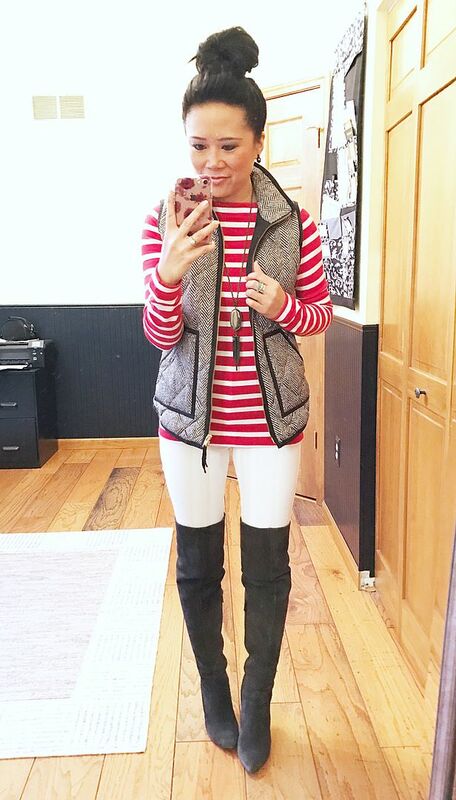 Loving the herringbone vest and red stripes combo! I used to have a red striped top but donated it because of the Where's Waldo effect. Now I am wishing I hadn't done that! You wardrobe is so verstile. I love how you always mix things up. I feel like I'm always posting a different variation of the same outfit. Haha. I wish I had the legs to wear those kinds of boots! So adorable! That cardigan in the first photo is my favorite. Stopping over from the linkup. Hope you can hop by my blog as well. Happy Friday!